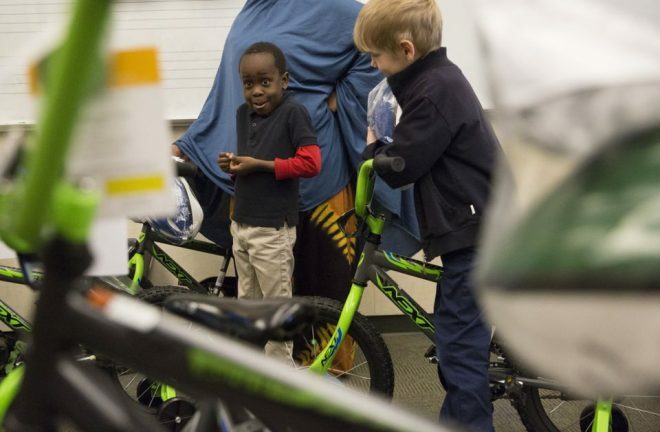 Monday morning, dozens of kindergarten students at Rosa Parks Elementary were lovingly gifted their first ever bicycle, just in time for the warm weather. As soon as the students entered the classroom, their tired faces transformed to exude their excitement. David Yandell, Portland native, recognizes the importance of helping one’s own community in any way possible. He has long been raising money for the Portland community, raising over a hundred thousand dollars in the past twenty years. One of his self-given jobs is to organize bike donations every year, this year inspiring James Meyer, local architect, to donate and distribute. He saw that this simplicity grows community and creates friendship through unifying activities. Bicycles help cultivate active out-of-door summers, which many parents wish their children could have. Meyer further emphasized the joy which he gained through the donation and the importance of seeking out opportunities to impact other’s lives. He encouraged any capable parties to do likewise. This gift of bikes has the great potential of leading to a summer of joy in community. Lydia is from northern Oregon. She is in the process of achieving her Bachelor's in English Literature at Hillsdale College. She enjoys attempting to do yoga, playing with dogs, and reading in obscure places in nature.